Beautiful ways to optimize the daily interaction among patients, families and caregivers. For over 30 years AmFab has been a leading manufacturer of high quality healthcare products covering three main markets: Acute Care, Long Term Care, and Home Care. 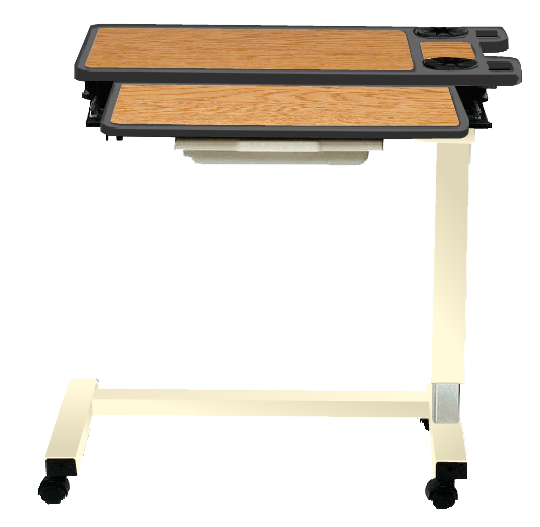 Our high quality products are designed to make both the patient’s and caregiver’s lives better and include: overbed tables, communication boards and cabinets. This combination, along with our ability to customize every aspect of these products, makes AmFab the best choice for your next product need. AmFab cabinets available in days, not weeks, come ready to assemble and can ship via UPS. Assembles in minutes and will meet the requirements of inspectors. Features include "soft pull" handles and round corners that provide for safety against accidents and snags which is especially valuable if residents suffer from any degree of dementia. Product offered stock in Gunstock Walnut. Contact us for pricing and minimums on special order laminates.